Some Texas sheriffs are looking to an unlikely source to get them out of the hole as private prisons win away federal contracts for inmates and put the financial squeeze on county jails. Federal prisoners translate to dollars to local detention facilities — mainly county jails — which are reimbursed at a rate that can exceed $50 a day for each federal inmate they house. But competition from private prisons in Texas continues to shrink that potential pool of inmates for smaller, poorer counties, leading some local governments to ask help from an agency better known for its fever tick riders than building jails. The Department of Agriculture is currently considering whether and how it will grant or loan Webb County about $5 million, said Sheriff Martin Cuellar, which will be used to build a new county-owned jail. County governments and the U.S. Marshals Service negotiate federal-prisoner contracts, some of which used to be a steady secondary source of revenue for Webb. But Cuellar’s future plans could be thwarted by the region’s brand new detention facility, the privately owned Rio Grande Detention Center, which undoubtedly wants to see all of its roughly 275,000 square feet put to use. The new prison is nestled just outside the City of Laredo’s boundaries and can house 1,500 inmates, including up to 68 female detainees. Opened in October 2008, the detention facility was for years a source of bitter dispute because of opposition to the detention center’s owner and operator, the Florida-based GEO Group, and its record of alleged human-rights abuses within the confines of its facilities in Texas. Local officials nonetheless hailed the facility as a job creator, and a source of revenue through utility contracts with Webb County. But Cuellar says the county is losing $500,000 annually because inmates are going to GEO instead of the county lockup. Cuellar said it's helpful knowing people at the federal level, in this case, his older brother, U.S. Rep. Henry Cuellar, D-Laredo, who the sheriff said has helped guide the department in the right direction. “Through what they call the Rural Communities Facilities Program there is a way that you can use funding to build community centers, you can build city halls or you can even build jails,” said Rep. Cuellar, a member of the House Agriculture Committee. Rep. Cuellar also worked with Jim Hogg County, said Sheriff Erasmo Alarcon, who will soon see about $5 million come in from the USDA to help triple the prisoner capacity in his county. 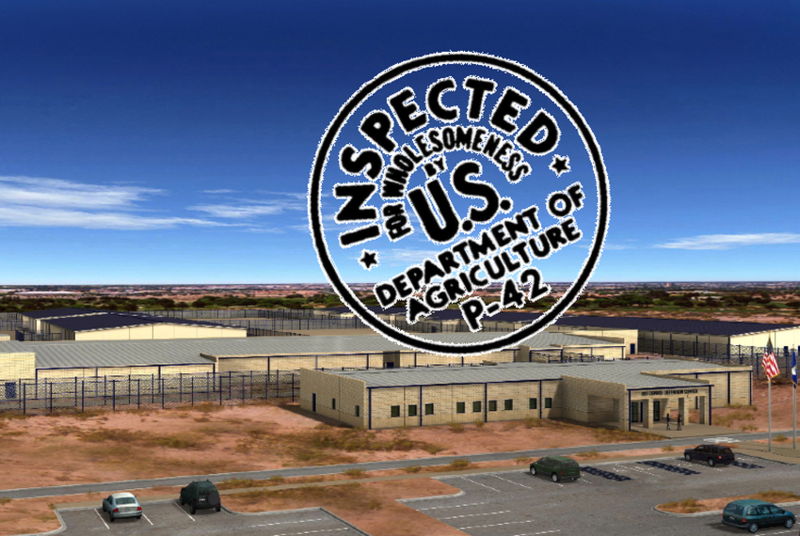 Alarcon got word last month that the USDA will award the request as a 25 percent loan and a 75 percent grant. The new county facility will expand capacity from the current 18 to 48, he said. In November 2008, Jim Hogg voters approved $5.2 million in bonds to build a new facility, and discussions about private prisons did surface, said Alarcon. The county eventually decided it wanted something under more local control. “We needed a jail that we could operate through the county and have something to show for it,” he said. Asked why not more community centers and less detention facilities, Rep. Cuellar deferred to local leaders. The USDA also provides money for clinics, schools, water infrastructure projects and even telemedicine, added Cuellar. Though Jim Hogg County does not sit directly on the Rio Grande, Alarcon said “enough” gets by to warrant a greater prisoner capacity. That sometimes leads to farming out inmates to other facilities, said Alarcon, with county tax dollars riding shotgun in the transport vehicle. “We have contracts with Starr, Zapata and surrounding counties. Taxpayer money goes to their county and not our county,” he said. A new jail, Alarcon added, could also mean Jim Hogg could join the cash-for-prisoner dialogue. “That’s probably when we will be able to hold some federal prisoners. We haven’t held any in ten years,” he said. Webb County's application is pending with USDA. Other issues, including whether any awards require a county match and how Webb can maximize county buildings that already exist, are being considered, said Sheriff Cuellar. For the sheriff, whose jail is within walking distance of the Rio Grande and the Mexican state of Tamaulipas, it’s not just the private-prison drain. Frequent task-force operations targeting alleged cartel gang members and their associates can translate into mammoth financial losses. Inmates often have to be separated due to their gang affiliations, said the sheriff, which could mean less room for others. That, together with the number of beds reserved for federal inmates that don’t come in, and state regulations that suggest county jails max out at only 90 percent of their capacity, means Webb County pays out six-figures annually to other counties. Also looming are the inspections from the Texas Commission on Jail Standards. The agency performs on-site reviews of county jails at least annually and checks everything from ADA compliance and the jail population to kitchen safety and medical care.